Fire Bars (also parsed as Fire-Bars or Firebars) are rotating rods made of fireballs first appearing in Super Mario Bros. They are found in numerous titles throughout the Mario franchise. They are generally found in fortresses and act as dangerous obstacles that Mario must avoid in order to reach the goal. Fire Bars were also given notable appearances in certain castles of Super Mario World 2: Yoshi's Island, which depicted them as swinging three-dimensionally. A three-dimensional Fire Bar depicted with eyes also appeared in Waluigi Stadium and Bowser's Castle course of Mario Kart: Double Dash!! Fire-Bars make their debut in Super Mario Bros. They are not a living enemy and function more as an obstacle as they rotate around a block in a clockwise or counter-clockwise direction. They often appear on the ceiling and floors of castles. If Mario or Luigi makes contact with one he will take damage from the fire. In later games, they are replaced with similar-acting obstacles such as Roto-Discs and Spinners. Some castles have longer Fire-Bars composed of 12 fireballs, as opposed to the normal-length Fire-Bars with six fireballs. If the player beats the game and restarts on Hard Mode, Fire-Bars will appear in all possible locations in castles. 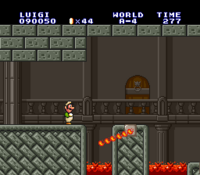 Fire-Bars also appear in Super Mario Bros.: The Lost Levels. As in Super Mario Bros., they spin around in a similar fashion. In some castles, there are huge Fire-Bars with at least 14 fireballs, unlike the normal Fire-Bars, which usually have 6 fireballs. Fire-Bars from Lethal Lava Land. In Super Mario 64, they appear for the first time in full 3D. They only appear in Lethal Lava Land. Unlike Fire-Bars' 2D appearances, here they spin horizontally. Also different from their 2D appearances, there can be more than one Fire-Bar rotating on the same axis. Fire Bars in New Super Mario Bros.. In New Super Mario Bros., Fire Bars first appear in World 6-4. They also appear in the second tower of World 8, and a lone one appears in Bowser's Castle. Here they act just like they do in Super Mario Bros., but are found more commonly more on the ceiling and floors. Fire Bars in Sling Pod Galaxy. In Super Mario Galaxy, they appear as obstacles in a number of different galaxies, including the Sling Pod Galaxy, the Toy Time Galaxy, Bowser's Star Reactor, and Bowser's Galaxy Reactor. They function the same way as in Super Mario 64. A Fire Bar in New Super Mario Bros. Wii. 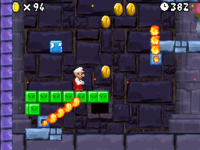 In New Super Mario Bros. Wii, Fire Bars only appear in World 8- , World 8- and World Coin -1, and are often used to guard Star Coins. A double Fire Bar also appears in the tower. In the castle, they are mainly seen in the first room, and only two are seen in the second room. Fire Bars in Bowser's Galaxy Generator. In Super Mario Galaxy 2, the Fire Bars' function is the same as in Super Mario Galaxy. They mainly appear in Bowser Jr.'s Fiery Flotilla, Bowser's Gravity Gauntlet, the Slipsand Galaxy, and Bowser's Galaxy Generator. It is also of note that rotating Fire Bars are used during the boss battle with Bowser Jr.'s Boomsday Machine in Bowser Jr.'s Boom Bunker, where they are integrated directly into the Boomsday Machine. Fire Bars reappear in Super Mario 3D Land. Here, they appear in most castles and World 8-6. As with all 3D Mario games, these Fire Bars spin horizontally. They cannot be defeated by any means. This game also introduces Spike Bars, which are essentially duplicates of Fire Bars with spikes. Fire Bars in World Star -7. Fire Bars appear again in New Super Mario Bros. 2. They have the same pattern from both predecessors and may also sometimes hide Star Coins. Fire Bars only seem to be one fireball longer then past games. They mostly appear in castle levels and some World 6 levels. Huge Fire Bars in New Super Mario Bros. U. Fire Bars reappear in New Super Mario Bros. U, where they appear in Screwtop Tower and Slide Lift Tower. Huge Fire Bars also appear, first appearing in Slide Lift Tower. Huge Fire Bars also have a whole level based around them in Superstar Road called Fire Bar Cliffs, which is home to many Huge Fire Bars. Fire Bars in Super Mario 3D World. Fire Bars appear in the game Super Mario 3D World. This time some of them rotate around Brick Blocks and ? Blocks. Spike Bars also return with a new appearance. Fire Bar sprite themes in Super Mario Maker. Fire Bars reappear as a course element in Super Mario Maker, Super Mario Maker for Nintendo 3DS, and Super Mario Maker 2. Their length and direction can be adjusted. The center block has a new sprite in the Super Mario Bros. theme, and new sprites were made for the Super Mario Bros. 3 and Super Mario World styles. Fire Bars reappear in Super Mario Run, as obstacles in the levels Fire Bar Castle! Youch! and Bowser's Bob-ombing Run. In Fire Bar Castle! Youch!, a Fire Bar appears during the battle with the Fake Bowser. Fire Bar from Super Mario World 2: Yoshi's Island. Fire-Bars appear in Super Mario World 2: Yoshi's Island and its remake Yoshi's Island: Super Mario Advance 3. They appear in certain forts and castles. They are usually depicted as swinging three-dimensionally. They also reappear in Yoshi's Island DS. Fire Bars in Waluigi Stadium. Fire Bar in DS Wario Stadium of Mario Kart 8. Fire Bars make several appearances in the Mario Kart series. They make their first appearance in Mario Kart: Double Dash! !, where they appear on the Waluigi Stadium, Wario Colosseum and Bowser's Castle courses. Fire Bars later return in Mario Kart DS, in the Wario Stadium course. Here the Fire Bars have three bars coming off of an eyed central cog. 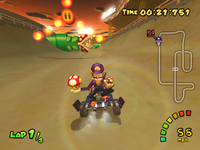 Fire Bars reappear once again in Mario Kart Wii, in the Waluigi Stadium retro course and the game's Bowser's Castle, although in this instance, there are Lava Bubbles at the center. They are also called Podoboo Cogs, keeping consistency with their appearance. 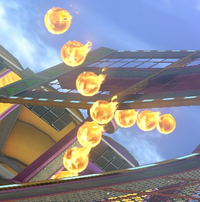 Fire Bars make reappearances in Mario Kart 8's Bowser's Castle course and in the DS Wario Stadium retro course. Here the Fire Bars have the same forms as in Mario Kart DS. Similar obstacles, rings of fireballs called Fire Chains, appear in a few of these titles as well. A Fire Bar as seen in Mt. Lavalava. 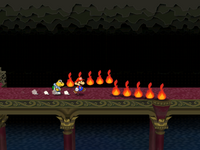 In Paper Mario, the Fire Bars reappear in Koopa Bros. Fortress and Mt. Lavalava; this time they swing sideways. They also swing either clockwise or counter-clockwise. If Mario touches one, he loses some HP, but if Mario's partner touches one, nothing happens. Jumping over one of these Fire Bars causes it to swing faster. If Mario dodges one ten times, it will vanish and drop a number of coins. This is the first appearance in which Fire Bars can be destroyed. A Fire Bar as seen in the Palace of Shadow. In Paper Mario: The Thousand-Year Door, they reappear in Bowser's third platform level. Here, they can be defeated by Bowser's firebreath. If Bowser come in contact with the fireballs, they can either decrease his size or defeat him (if he's tiny). They also appear in the Palace of Shadow and have the same behavior as they do in Paper Mario. A Fire Bar as seen in Yold Ruins. A Fire Bar sprite in Super Paper Mario. Fire Bars reappear in Super Paper Mario. In the game, they act in a similar fashion as in Super Mario Bros. and appear in Chapter 1-4 and 8-2. Mario can flip into 3-D mode to avoid the Fire Bars. Fire Bars in Mario Party 4. Fire Bars also appear in Mario Party 4 in The Final Battle! They take away a heart from the player when touched. Fire Bars in Mario Party: Island Tour. 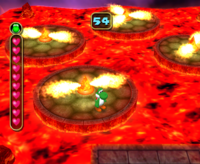 In Mario Party: Island Tour, Fire Bars appear in the minigame Great Bars of Fire. The players need to jump over them, and if a character hits a Fire Bar three times, they are out, and the last player standing wins. Fire Bars in Mario Party 10. Fire Bars reappear in Mario Party 10. They are found in the Bowser Minigame Bowser's Fire Bar Fury. In Mario Party: The Top 100, Fire Bars reappear as the same rules in the minigame The Final Battle! from Mario Party 4. A Fire Bar in Wario: Master of Disguise. Fire Bars appear as obstacles inside Sweatmore Peak in Wario: Master of Disguise. They consist of several small fireballs which rotate around a larger fireball. In Super Smash Bros. for Nintendo 3DS / Wii U, Fire Bars appear as an item. Once picked up, characters can attack others by swinging them, similar to the Beam Sword, although it is fairly powerful. However, every two hits from a Fire Bar causes it to lose a fireball, including blocked hits, shortening it in range. The fireballs closer to the base, however, deal more damage. Fire Bars reappear as items in Super Smash Bros. Ultimate. 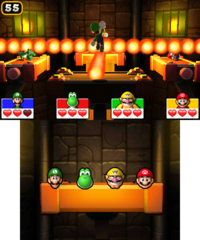 In Mario & Luigi: Paper Jam, Fire Bars appear in the Trio Whirligig minigame in the Arcade as obstacles. They are made up of two to seven bars, and touching one causes the minigame to end. Wii U New Super Mario Bros. U (11/2012) A rotating row of fireballs found in the Mario series, most often as a fiery obstacle in Bowser's Castle. In this game, you can swing the fire bar at your enemies! It's a powerful weapon, but for every two times you swing and hit someone with it, one of the fireballs will burn out. And no fire means no fun. 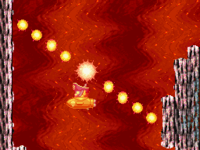 A rotating row of fireballs found in the Mario series, most often as a fiery obstacle in Bowser's Castle. In this game, you can swing the fire bar at your enemies! It's a powerful weapon, but for every two times you connect when attacking with it, one of the fireballs will go out. And no fire means no fun. According to Satoru Iwata, "...firebars, which appear in Super Mario Bros., had also been used early on in development of The Legend of Zelda..." They did not appear in the final game, but the concept was reused as the Guruguru Bar in The Legend of Zelda: A Link to the Past. The Fire Bar made a cameo appearance in the Animal Crossing games as a furniture item. In the Super Mario Mash-Up Pack in Minecraft, Blaze Rods are replaced by Fire Bars, though the Fire Bar is not connected to a block. ↑ In-game spelling (such as in the Paper Mario series, New Super Mario Bros. U, Mario Party: Island Tour, Super Smash Bros. for Wii U, and Super Mario Run). ↑ Hiroo Tochikubo, How to Win at Super Mario Bros., Tokuma Shoten, 1987, ISBN 4-19-720003-XC. Page 15. ↑ Tatsumi Yamashita, The Official Nintendo Player's Guide, Tokuma Shoten, 1987, ISBN 999832369X. Page 30. ↑ Super Mario All-Stars Player's Guide, pages 9 and 31. ↑ Hodgson, David S. J. Mario Kart Wii Premiere Edition. Pages 92 and 128.